Student Life and Leadership hosted its annual Halloween Carnival on Saturday, Oct. 27. Costumed children and their families filled the Student Center at the Taylorsville Redwood Campus from 10 a.m. until noon. Over 20 booths offered games, crafts and candy. The annual free carnival started in 1993. Peggy Hoffman, director of Student Services, reports that the carnival attracts an average of 700 children and their families, an estimated total of 1,000 people annually. Members of various clubs and organizations also participated in the event by running various carnival activity booths. Among the most popular was the Student Senate booth, where children were given a free full-size pumpkin to decorate with funny face stickers. Nearly all of the children were given a pumpkin, according to Hoffman. In just 90 minutes, Student Life and Leadership donated 300 pumpkins, she said. Many members of the college community were represented at the event. Among the participants were part-and-full time students, faculty and staff. An adopted immigrant child from Vietnam celebrated his first Halloween by wearing his first costume. 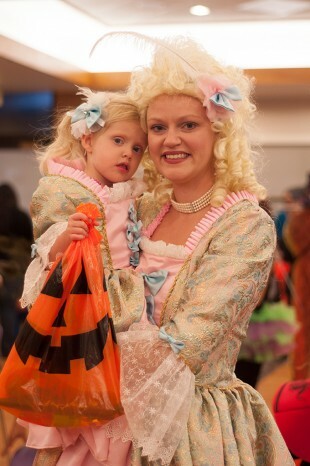 LeeAnn Richardson, a staff member of the Jordan library, came with her daughter.They were both dressed as the Queens of Versailles, attired in a powder wig and a full French dress ensemble. Event organizers Michelle Allison, vice president of Fine Arts & Lectures and Katie Sanderson, VP of Taylorsville Activities, attended in full costume as well. 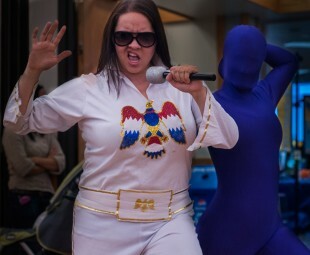 Michelvis, which Allison referred to herself as, dazzled the crowd in her Elvis costume and pulled off the look with a lip curl. Sanderson was barely recognizable when she pulled the hood of her purple morph suit up over her face. Jordan Library staff member LeeAnn Richardson and her daughter Charlotte dressed identically for the Halloween carnival. 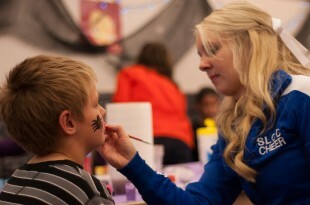 Brittani Nokes from Cheer painted children’s faces during the Halloween carnival. Michelle Allison and Katie Sanderson were organizers for the Student Life and Leadership Halloween Carnival.